The arraignment of the man accused of starting a massive wildfire in Southern California's Cleveland National Forest was delayed for a second time after he had several outbursts in court Friday. A day after refusing to leave his jail cell for his first scheduled court appearance, 52-year-old Forrest Gordon Clark was escorted into a courtroom holding cell for his arraignment in Orange County on Friday morning. Clad in an orange jumpsuit, Clark at first attempted to hide his face from the courtroom camera with his long, dark hair. The judge informed Clark that he was being formally charged with felony arson, making criminal threats and resisting arrest, among other counts, in connection with the Holy Fire. "That's a lie!" Clark shouted as the judge read the charges aloud. Clark interjected again when the judge told him the bail would be set at $1 million. "I can have a million right now, easily," he yelled. The judge then stopped the arraignment and prosecutors and Clark's attorneys agreed to reset it for Aug. 17. 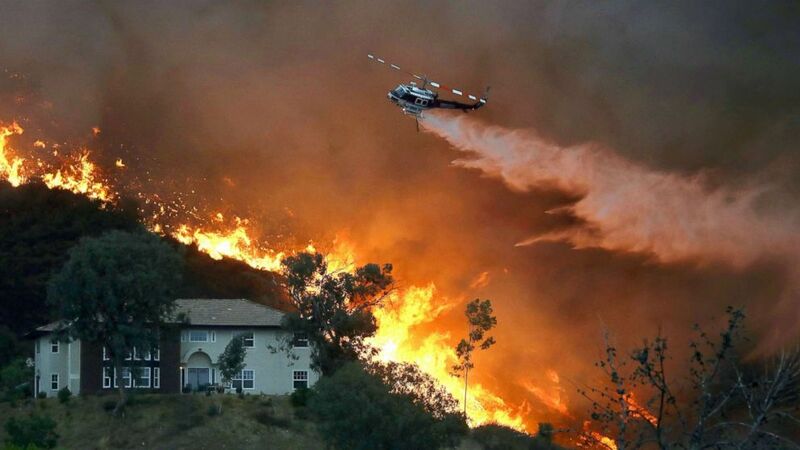 Clark, who was arrested Wednesday, is suspected of igniting the Holy Fire earlier this week in Trabuco Canyon, the small community where he lives, which is located partly within the Cleveland National Forest. He faces a maximum sentence of life in state prison if convicted on all charges, according to the Orange County District Attorney's Office. The Holy Fire has since exploded in size, prompting California Gov. Jerry Brown late Thursday night to declare a state of emergency for Orange and Riverside counties, two of the state's most populous. By Friday morning, the fast-moving blaze had burned an area of more than 18,000 acres by Friday morning and was only 5 percent contained, officials said. Throngs of firefighters are on the front lines battling the flames, using fire engines, helicopters and bulldozers. Mandatory evacuations were still in effect for various communities Friday morning. The Holy Fire is just one of 13 large wildfires currently burning across California, five of which remain under 50 percent contained. Altogether, the various blazes have scorched more than 671,000 acres, destroyed or damaged over 2,000 structures and have forced thousands of residents from their homes. No major injuries linked to the Holy Fire have been reported but the Carr Fire in Northern California has been blamed for the deaths of at least eight people, officials said. The "mechanical failure of a vehicle" ignited the Carr Fire in Whiskeytown on July 23, according to the California Department of Forestry and Fire Protection. The flames ripped through northwest Shasta County then spread southeast for days, with little containment, as it swept across the Sacramento River and roared toward the city limits of Redding, which is home to 92,000 people. By Friday morning, the blaze had burned an are of more than 181,000 acres in Shasta and Trinity counties. Some 1,600 homes, businesses and other structures have been destroyed by the Carr Fire, while hundreds of others have been damaged. Gusty winds, high temperatures and dry vegetation have spurred fire growth. But thousands of firefighters who have been continuously battling the Carr Fire have made progress in recent days. The blaze was 51 percent contained Friday morning, officials said. ABC News' Jenna Harrison contributed to this report.